Among the stocks in which FPIs raised their stake in the last four quarters, almost 10 of them have more than doubled investors’ money in the same period. Rising liquidity is one of the prominent factors which pushed benchmark indices and stocks to record high levels so far in the year 2017. The foreign portfolio investors (FPIs) have raised their exposure in as much as 55 stocks in the last four quarters. Among the stocks in which FPIs raised their stake in the last four quarters, almost 10 of them have more than doubled investors’ money in the same period which include names like Sharda Motor, West Coast Paper, IFB Industries, Himadri Speciality, Heritage Foods, NOCIL, Sundaram Clayton, MRF, Kirloskar Brothers, and Gujarat Ambuja Exports. 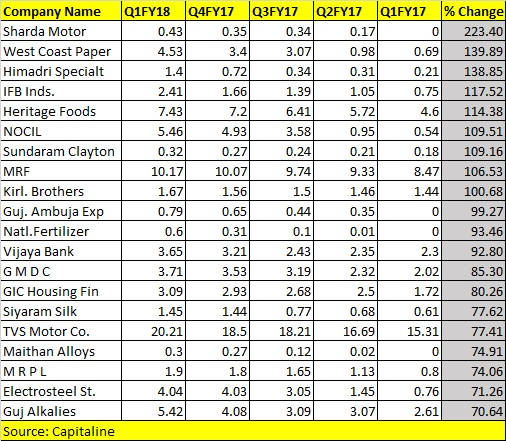 There are 11 such companies in which FPIs hold over 10 percent and have only added to their holding in the last four quarters which include companies like TVS Motor, Care Ratings, Crompton Greaves, Shriram City Union, Elgi Equipment, Shree Cements, Shemaroo Entertainment, UltraTech Cements, NIIT, La Opala RG, and Shriram Transport Finance. The recent investment trend suggests that FPIs are slowly moving their investment towards small and midcap names from largecap names which is a good sign. In the last 5 years, midcaps have outperformed Nifty by 50 percent and the way the momentum is going, the outperformance is likely to continue. “Institutions (domestic and foreign) appear to be favoring stocks where they see an opportunity either in terms of valuations or in terms of expectations on the business and fundamentals front. And to this extent, there has been a steady increase in stocks outside of the largecap universe as well,” Nitasha Shankar, Sr. Vice President and Head of Research, YES Securities (I) Ltd told Moneycontrol. Investors are always looking for better investing opportunities and they invest based on the new themes arising in the economy, suggest experts. However, not all firms in which FIIs raised their stake gave positive returns. Almost 7 companies out of 55 gave negative returns in which FPIs raised their stake in the last four quarters. Stocks which gave negative returns despite the hike in FPI stake include names like La Opala, Unichem Laboratories, Dr. Lal Pathlabs, Abbott India, MPS, Shriram Transport, and TV Today Networks. FPIs have already poured in close to USD 26 billion so far in the year 2017 but it is unlikely that the pace will continue in the second half of the year, suggest experts. It is estimated about one-third of the inflows of the Rs 56,261 crore inflows in March was linked to buying ahead of the implementation GAAR which makes it harder to avoid domestic taxes by routing investments through tax havens. “Several foreign funds have accelerated the investments to avoid the provisions of GAAR. Overseas investors had brought upfront their planned purchase of Indian stocks to before March 31 to take advantage of the grandfathering window so that they did not have to pay any extra capital gains tax,” Shashank Khade, Director and Co-founder, Entrust Family Office Investment Advisors told Moneycontrol. “Given the context of GAAR implementation related accelerated investing by FPIs, there could be a slowdown in incremental allocations to India in H2 CY17. A significant proportion of the annual allocations could have been already factored in,” he said. Shrikant Akolkar, Sr Equity Research Analyst, Angel Broking Pvt Ltd said that he expects foreign inflows to continue. “We must remember that earlier in this calendar year, we already saw record FII inflows,” he said. Akolkar further added that going ahead, higher inflows depend upon US interest rates, forex movement, and global geopolitical situations. 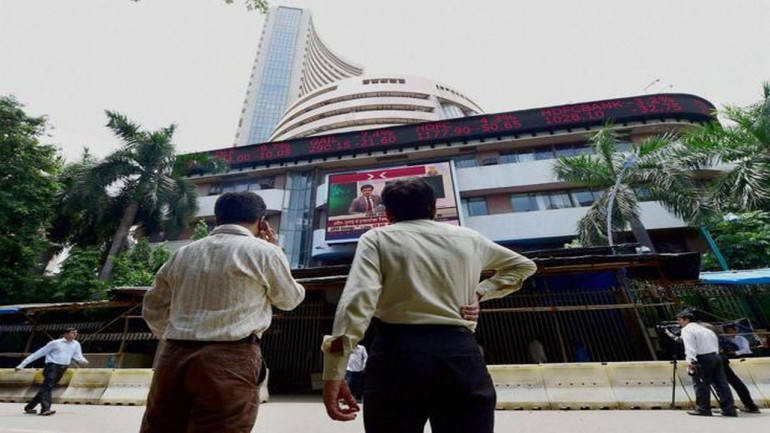 FPI heavy stocks a good bet? FPIs are moving towards stocks across midcaps, smallcaps and largecaps in search of attractive themes which would emerge going ahead. The list of stocks in which FPIs raise their stake could be used as a filter for investors when constructing their portfolio. History suggests that FPIs heavy stocks have outperformed markets in the last four quarters and only 10 percent of stocks gave negative returns in which foreign investors raised their stake. “While FPI raising stake in any company is definitely positive, that alone can’t be criteria for investing in a stock. One has to understand the business model, growth prospects, financial performance, risks involved, etc. before selecting a stock to invest in,” Siddhartha Khemka, Head – Equity Research (Wealth), Centrum Broking Limited told Moneycontrol. “An FPI investment dose give some comfort that it must have done the basic due diligence before investing. However, the risk appetite/investment horizon of FPIs would be very different from individual investors. Hence one needs to understand his own risk appetite and match that with his investment decisions,” he said. FPIs heavy companies could be a good buy since FPIs have dedicated research teams and access to information which the small retail investors generally do not have. That being said, retail investors should do their own research before putting their money. Retail investors should also study their risk profile before putting their money in stocks in which FPIs have increased their stake. On one hand, it does suggest confidence of foreign investors in the company but on the other, it may not fit your risk profile. “FPI investments should only be used as a starting point for the investors however they are still advised to do their own homework before investing their money in a particular company,” Jimeet Modi, CEO, SAMCO Securities told Moneycontrol. “It should be kept in mind that smallcaps and midcaps are extremely risky companies. FPIs have robust risk management strategies and invest only a small part of their portfolio in such companies,” he said. Modi further added that majority of their investments are in less risky largecap stocks and debt instruments, domestic investors should take care of their asset allocation at portfolio level wisely and not blindly follow the FPIs.